North and south exposures in this 3000 square foot loft in Tribeca allowed us to line the south facing wall with two guest bedrooms and a 900 sf master suite. The trapezoid shaped plan creates an exaggerated perspective as one looks through the main living space space to the kitchen. The ceilings and columns are stripped to bring the industrial space back to its most elemental state. The blackened steel canopy and blackened steel doors were designed to complement the raw wood and wrought iron columns of the stripped space. Salvaged materials such as reclaimed barn wood for the counters and reclaimed marble slabs in the master bathroom were used to enhance the industrial feel of the space. 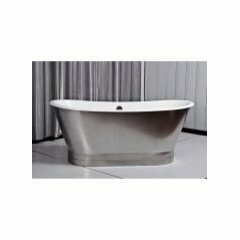 Can you share manufacturer of tub? Please visit Urban Archaeology's web site to see our Mercer tub . Wow! No mirror above the sinks? Is there a mirror elsewhere? The mirror was yet to be found when we took these photos. The intention was to have a large round mirror mounted in front of the window. Now there is a large mirror above the double vanity. And there is and never been a mirrored wall behind the tub. There's also a make up vanity with a small mirror just off to the right off this picture. i love the tub and the sinks! can you tell me about the sink fixtures? Are the sinks finished on the bottom? The tub is Urban Archaeology's Mercer tub. Where can I purchase the double-sink? Who is the manufacturer? - I love that double sink and want to check out the dimensions, as I'm buying a home and need to redo the master bath. Hi, we have a wide array of washstands. Please check them out on our web site. Hi Urban Archaeology, do you have ADA compliant washstands? Brick name or color? Also, same for flooring? Not sure on the brick, but the floor looks like pine. The brick is existing- it's more than 100 years old. The flooring is antique oak. sink stand - I have an old ceramic double sink that I have acquired for our bathroom redo, but have not yet been able to find a support for it. where could I look for a sink stand similar to this one? I found this one for possible use in our remodeling job. It's by Palmer Industries and be prepared for sticker shock. Their 68 x 22 x 32 was close to $4000 just for the base! They are the best in the business, however, for this look. Good luck. how do i enter the contest for bathrooms? thank you!! - how do i enter the contest??? thank you!! rug - I love this rug. where can it be purchased? Love love love!!! The satin nickel bathtub, the vanity in the master bath and the majority of other fixtures, like towel bars and lights, are from Urban Archaeology. If you've recently finished a room with newer metal, work in reclaimed wood, like shelving. Choose a waterproof version. In a bath, especially one used every day, your TV will be subject to moisture buildup and damage over time. Select one that's rated for bathroom or outdoor use, meaning it can withstand wet environments. Also, some models have built-in fog resistance, which comes in handy if you like really long, steamy showers. I love this photo. The brickwork and it's colour is the perfect colour for the type of brickwork that I wish to utilise in the kitchen at Bailey Street. See how this one seems stabilized at the base? Single sink (not two) and shelves on the side wall.